de don Pedro Calderon de la Barca. Printed at Madrid by L.A. de Bedmar, between 1699-1715, probably 1701; see Reichenberger, v. 1, p. 302.;In this variant, 4th line of title consists of 3 words: Teagenes, y Cariclea. ;Printed mostly in double columns. Reichenberger, K. & R. Bibliographisches Handbuch der Calderón-Forschung, 1177. In a leather binding with blind-stamped rolls forming a panel and frame design. 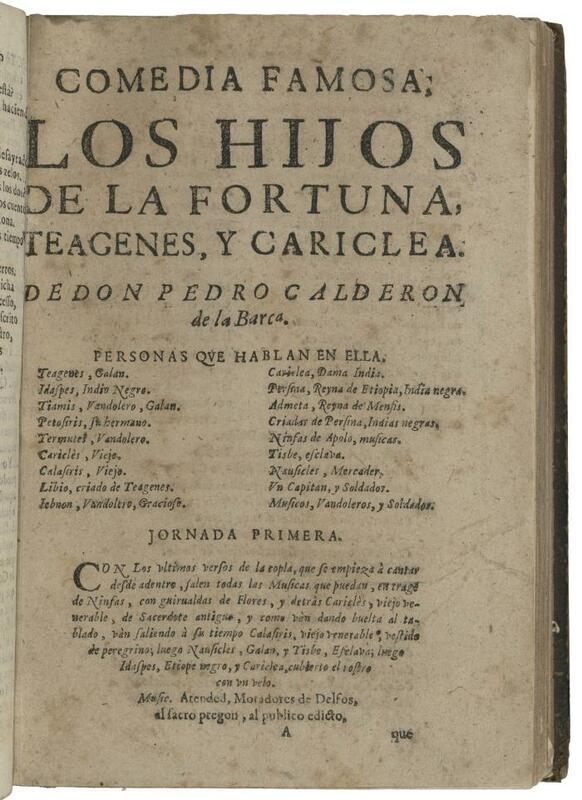 Bound 3rd in volume with 11 other plays by Calderón de la Barca. Curatorial file available.